Someone asked me if bear spray really works. Yes and no, if it's black bear maybe, if it's not determined, grizzly forget it..but with the right gun.bear spray and lucky timing you could get enough time to run for it..best to have a plan..just in case..make sure to tie your food away from campsite and up in a tree..don't cook or eat where you sleep, ever, have a cook camp at least 100 yards away from where you sleep..i never had a problem in Alaska, but the bears in the Cascades have no fear, so be careful there. I have bear spray for self defense rather than bears. but harvesting my own would be a gas! It's my understanding that bear spray can be purchased anywhere. In some states you have to go to a specific dealer to get pepper spray. And frankly, for me it's like carrying an umbrella; insurance I won't need it. It's like keeping the flashlight/truncheon next to my bed. good to know Femmewench ..i have both. the pepper spray is on a chain. 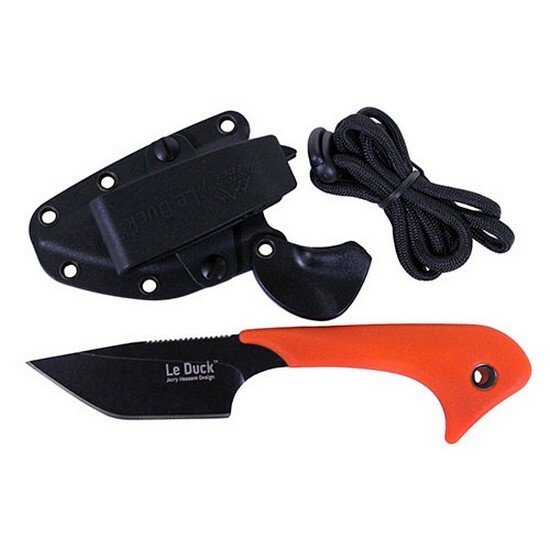 Just picked up a Le Duck neck knife. The sheath has a unique locking system that takes a bit to get used to but not bad. Nice blade shape, light. The one drawback is when grabbing it from sheath I can't get a full grip on it..i've not used it yet, this is just my first impression. Check it out. I'm not one of those "outdoorsy" type butches! I don't fish, hunt, or camp..
also...fyi..even on a day hike, take a survival kit..expect to get lost or to have an accident.-keep your pack in your car and keep it lighter so you won't be tempted to leave it behind! Oh I'd say I'm COMPLETELY lost when it comes to this thread........perhaps there is a Bushcraft For Dummies edition I could pick up? there are a few good books on Bushcraft..even an audiobook. My next challenge is mushrooms.. a skill i'll need for an extended stay in the woods.